A felicitation dinner to welcome Chief Justice Asoka N. De Silva the second Anthonian to be appointed Chief Justice after the late Victor Thennakoon organised by the parent body of St. Antony's College, Kandy Old Boys' Association will be held at Mahaweli Reach Hotel, Kandy on July 31 from 6 p.m. onwards and it will be blessed by the presence of His Lordship the Bishop of Kandy. Interested Antonians to contact Timothy Paldano on 0777352036 or Dickie Duniwilla on 0772990135 for reservations. The Peoples' Republic of China's Confucius Language Education School at Lumbini Vidyalaya, Havelock Town, Colombo 5 is scheduled to be opened at 10.00 a.m. on July 28. A workshop on “Crisis in Translation in the Administration: What is to be done?” is scheduled to be held on July 30, Thursday at the Bandaranaike Centre for International Studies, BMICH, Bauddhaloka Mawatha, Colombo 7 from 9.00 a.m. to 4.30 p.m. The newly constructed train halt at Pengiriwatte, Gangodawila on the Kelani Valley Railway will be opened by Foreign Affairs Minister and the Chief Organizer of the SLFP for Kotte electorate Rohitha Bogollagama with the participation of Transport Minister Dullas Alahapperuma on July 28 at 4.00 p.m.
Acting Ambassador of the Federal Republic of Germany Dr. Stefan Weckbach officially inaugurated the “German Language Training Centre” at Royal College Colombo recently. This state-of-the-art German Language Training Centre was established in collaboration with the Goethe-Institut Sri Lanka and the Foreign Affairs Ministry of the Federal Republic of Germany. The inauguration of this Centre also sees Royal College becoming Sri Lanka’s first-ever National School to gain Partner School status. Federal Foreign Minister Frank-Walter Steinmeier launched the “School’s Partners for the Future” Initiative to build up a worldwide network of at least 1000 partner schools through which to awaken young people’s interest in and enthusiasm for modern-day Germany and German society. As part of this program, the network of German schools abroad and schools offering the German Language Certificate has been strengthened and extended. The cooperation between these schools is being expanded to anchor German as a foreign language more firmly in national education systems. With this comes the development of fruitful and long-lasting ties with Germany, inspiring schools, their teachers and pupils to enjoy an open exchange of views and engage in co-operation. A presentation for Young Professionals on “Integrity in Professional Relationship” by B.K. Seelan. (Meditation Teacher, Businessman) will be held on Tuesday, July 28 at 6 pm at the Brahma Kumaris Raja Yoga Centre, 124, Sri Gunananda Mawatha, Kotahena. Young professionals of any profession are invited to participate. For further details please contact 011-2717572, 011-2344106. All programs of Brahma Kumaris are free of any charge. Panadura magistrate Thusara Rajasinghe imposed a three months sentence suspended for five years on two three wheeler drivers who pleaded guilty to a charge of dumping garbage on the public road at Totawatta, Panadura. 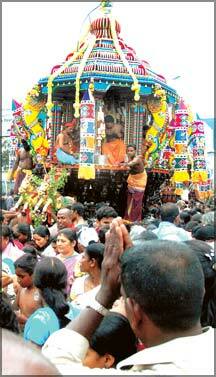 The Government has already granted permission for the people in Jaffna to travel from Jaffna to Colombo and return. Further all check points will continue to function and other search activities too will continue due to security reasons. However, the Government has made arrangements to organise transport facilities to the people of Jaffna to travel to Colombo and return. Kalutara District United National Party (UNP) Parliamentarian Sarath Ranawaka passed away on Saturday morning, he was 58. MP Ranawaka, a father of three had passed away at a private hospital in Colombo after a brief illness. He entered active politics in 1977 by representing the Lanka Samasamaja Party. He joined the main opposition United National Party in 1984. The late MP represented the Sri Lankan Parliament for the last 20 years after he was elected in 1989 for the first time.